Perry has been raised to be the perfect Lakti warrior. 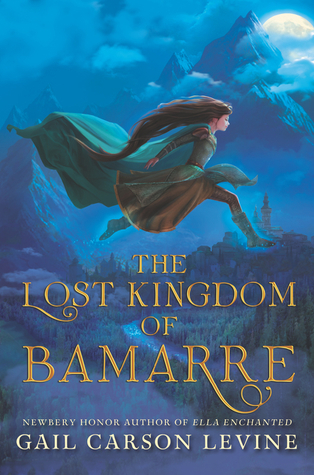 Her father is third in line for the throne of a kingdom that, many years ago, sought asylum from a plague of monsters in the peaceful neighboring kingdom of Bamarre - then turned on the Bamarre, conquered and enslaved them. Perry's beloved father Lord Tove despises the subjected Bamarre people for their cowardice. Little does Perry know, until a fairy sets the record straight, she is actually a Bamarre, forcibly adopted by her childless Lady Mother, after her real father was caught stealing food. Her sour-faced Bamarre nurse Annet is actually her older sister. And the perfect Lakti daughter is now, in one fairy godmother's opinion, the best hope to free the people she never guessed were her own. Perry has her people-freeing work cut out for her. When Tove realizes what his adopted daughter is, his fury is terrifying. Perry learns that she has misjudged both of her parents - not only the always (until now) loving Tove, but also the seemingly cold and distant Lady Mother. Plus, getting the Bamarre to accept her isn't easy, and leading them to freedom is even trickier. Their peaceful, passive-aggressive manners are a difficult adjustment for her. For one thing, she is used to telling people what to do - a dead giveaway that she isn't a typical Bamarre. Her pride, her independent streak, and her habit of speaking out of turn or even contradicting those who have spoken first, put her at odds with the family she lost and found again. Only with luck, a fairy-made disguise as an elderly aunt, and some handy magical items (such as seven-league boots) will she have any chance of uniting her people in a rebellion against the treacherous Lakti. Then, she just has to face her once worshiped father (Tove, I mean) in a duel on which the fate of two kingdoms depends. The synopsis I have just given doesn't do full justice to this magical romance, weaving together threads of multiple princess-centered fairy tales into one compelling novel. Besides the issues of racial prejudice and cultural differences, it also touches on the horror of war and the often overlooked type of courage that refuses to kill. It has dragons, gryphons, ogres, and specters in it, besides fairies and at least a hint of elves and dwarves. It also has a wonderful world in which men and women are different, but no one entertains a doubt as to their equality. Fans of Howl's Moving Castle and the animated film Tangled may get a special charge out of this story, which is obviously a companion to Levine's 2000 book The Two Princesses of Bamarre and, in a less obvious way, of her books Ella Enchanted, Fairest, and Ever. Gail Carson Levine is also the author of Dave at Night, the six "Princess Tales" books (The Fairy's Mistake, etc. ), A Tale of Two Castles and its sequel Stolen Magic, The Wish, and Forgive Me, I Meant to Do It: False Apology Poems, among other books. As I have noted before, her work is an important recent development in the reinterpretation of classic fairy tales. But don't let that word "important" scare you. It's also beautiful, heart-touching, and full of fun.